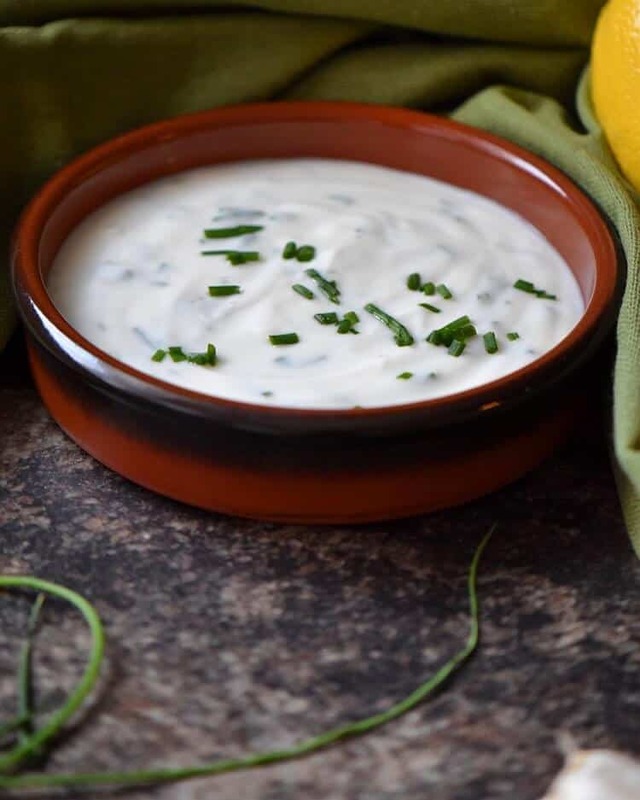 Home » Condiments and Sauces » Homemade Garlic Yogurt Sauce -healthy and fresh! Homemade Garlic Yogurt Sauce -healthy and fresh! This Homemade Garlic Yogurt Sauce is the perfect complement to a great variety of food! Healthy & fresh with an ever-so-slight tanginess, you’ll love it! Looking for a little something-something to top off your savory recipes? Look no further! 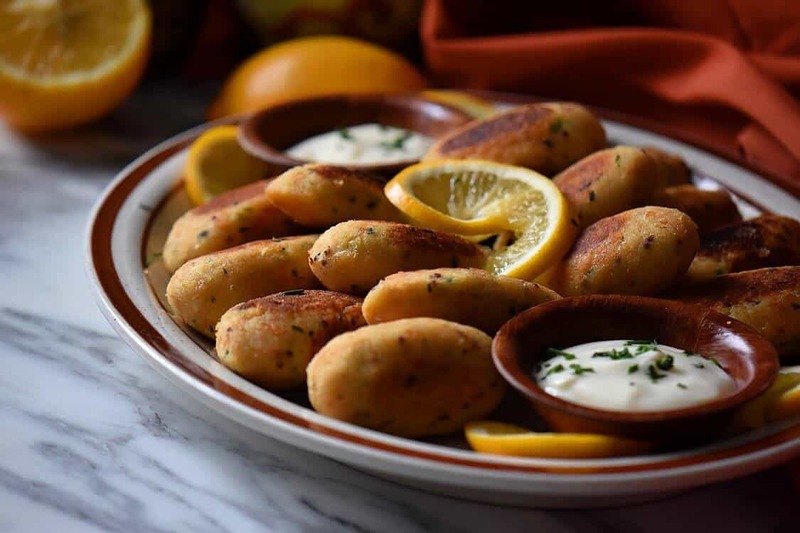 I love using this yogurt sauce with foods that I pan-fry, as was mentioned, there are these tasty chickpea sticks, but I also use it with these zoo sticks, these tasty zucchini fritters or my mom’s recipe for the Best Homemade Italian Potato Croquettes, because the flavors complement one another so well! I also love them with these salmon croquettes (pictured above). While pan-fried foods tend to feel richer, denser, like they pack a punch, the yogurt sauce is sweet, slightly tangy, and light. The two are truly a match made in heaven. That being said, I also love this yogurt sauce on grilled vegetables with lots of herbs, as a salad dressing, and with roasted potatoes! It is such a subtle and fresh sauce, it can go well with almost anything. But my favorite thing about the yogurt sauce? How healthy it is, of course! Somehow, I always associate dipping sauces with mayonnaise and heavy cream, which you can imagine are not to be indulged in too frequently. But the main ingredient of this yogurt sauce is – surprise! – yogurt! Yogurt provides some protein, and gives you a healthy dose of nutrients like calcium, vitamin B-2, vitamin B-12, potassium, and magnesium. The only things I add to the sauce are chives, lemon juice, and fresh minced garlic, which certainly don’t take away from any of the health benefits I just mentioned! So dip, and double-dip (gasp!) away – this sauce won’t go against any New Year’s resolutions. Am I allowed to have a second favorite thing about the yogurt sauce? Because I do! It’s the versatility of it. Since it is obviously enjoyed raw, I feel safe sampling it as I make it, and adding ingredients I feel would make it more suited to a particular recipe on the fly. Then, I try it again, and re-evaluate. For example, if you’re making it as a salad dressing, you might try adding apple cider vinegar and oil to it. Instead of squeezing in lemon juice, you might like to try it with the juice of a lime instead, if that’s all you have handy. You can try adding different herbs and spices to it, like parsley or tarragon, and see if you like the overall taste. If you’re unsure about the additions you are making, take a bit of yogurt sauce aside, add it to just that portion, and see if you like it. Experiment, play! That’s where I find joy in cooking! I think that foods that combine two or more flavors from sweet, salty, bitter, and sour end up with the most pleasant, complex tastes! So if you try your yogurt sauce and find it to be a little one-dimensional, think of what flavor characteristic it is missing, and try adding that. This particular yogurt sauce uses vanilla-flavored yogurt for some extra sweetness, and lemon juice for some sourness. 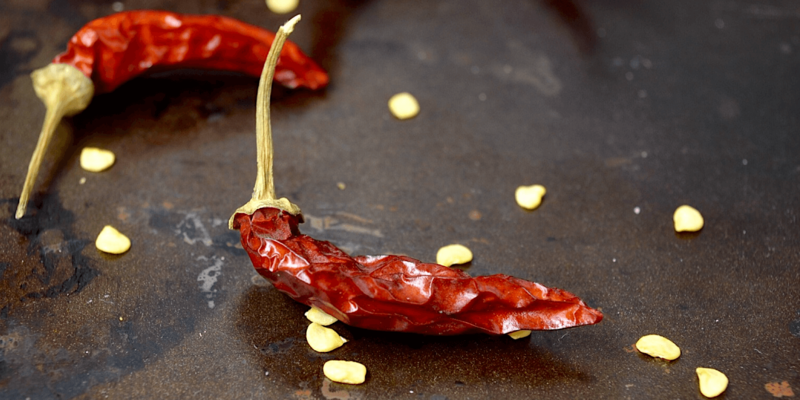 Here is another thought… have you ever accidentally added too much chili to a spicy dish you were making? Yogurt sauces (and, more generally, just drinking a glass of milk) can help curb that spicy taste. That’s why I find that this yogurt sauce pairs especially well with ultra-spicy food – the spice is still there, but tamed. I think there might be a cooking gene in my family, and I think my daughter inherited that gene. Lucky me! It fills me with so much pride to see her working her way around the kitchen, and the times when we cook and bake together are some so, so cherished. 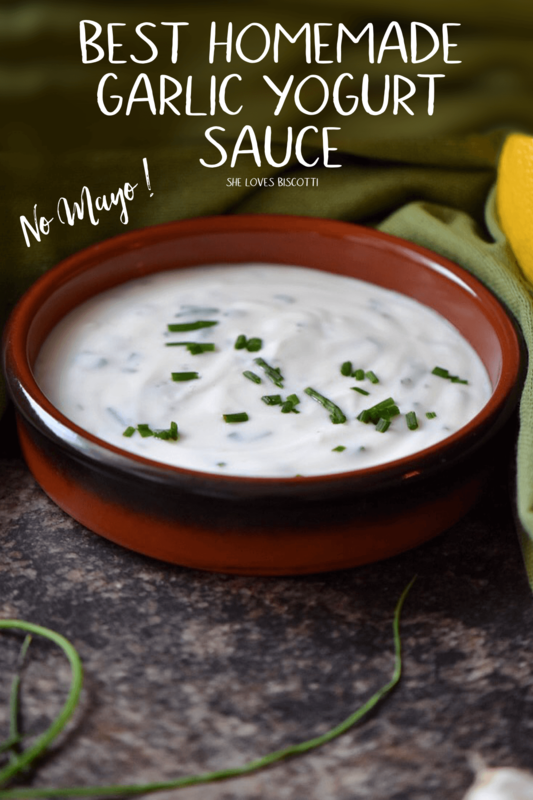 This Best Homemade Garlic Yogurt Sauce is something that she created spontaneously one day, when something she was cooking turned out a little bit too spicy. She liked it, so she continued making it whenever her hand slipped on those red chili peppers. Eventually, I caught sight of her making it, and trying it, thought it would be a great addition to other foods, too – not just spicy stuff. Try this yogurt sauce with a variety of recipes – you won’t believe how versatile it is until you do. Let me know in the comments below how you adapted it to your tastes, and what recipe you combined it with! If you have made this recipe for yogurt sauce, I would love to hear about it in the comments below and be sure to rate the recipe! Healthy, fresh & sweet with an ever-so-slight tanginess, you’ll find that this easy to make Best Homemade Garlic Yogurt Sauce is the perfect complement to a great variety of food! IF YOU ENJOYED THIS YOGURT SAUCE POST, SAVE IT FOR LATER. PIN IT TO YOUR CONDIMENTS AND SAUCES BOARD! I love this and thanks for all the ideas on how to use it. A few times a quick yogurt sauce has save my too , from extra spicy curry or chili. It is something that is always in my fridge. I love yogurt and have been trying to ‘cook’ with it more. This saucy dip will be making an appearance at snack time soon! Haha looks so good!